An archaeological sites in the cliffs above San Juan de la Rambla and in two major barrancos may well complicate or halt plans to extend the motorway along the northern coastline of Tenerife. The Government has approved a decree by which the cliffs as well as the Chaurera and Ruíz barrancos are to be declared areas of cultural interest and classified as an archaeological zone. In other words, they could become untouchable by law. The area is a maze of caves and aboriginal Guanche dwelling sites, many of which have been excavated and well documented since the 1950s. Many of the sites have been tamped with over the years. Experts say these sites must be protected for their historic and scientific interest. Some of the sites already documented include a burial ground at La Gotera in the Poncio gorge, where human remains have been discovered along with primitive tools and utensils. 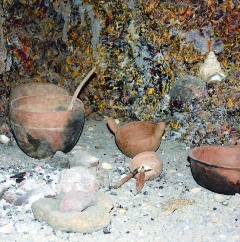 Stone-age ceramics were found in caves inside the Ruiz ravine. If this decree goes ahead it will confirm a recent trend where archaeological sites take priority over progress.